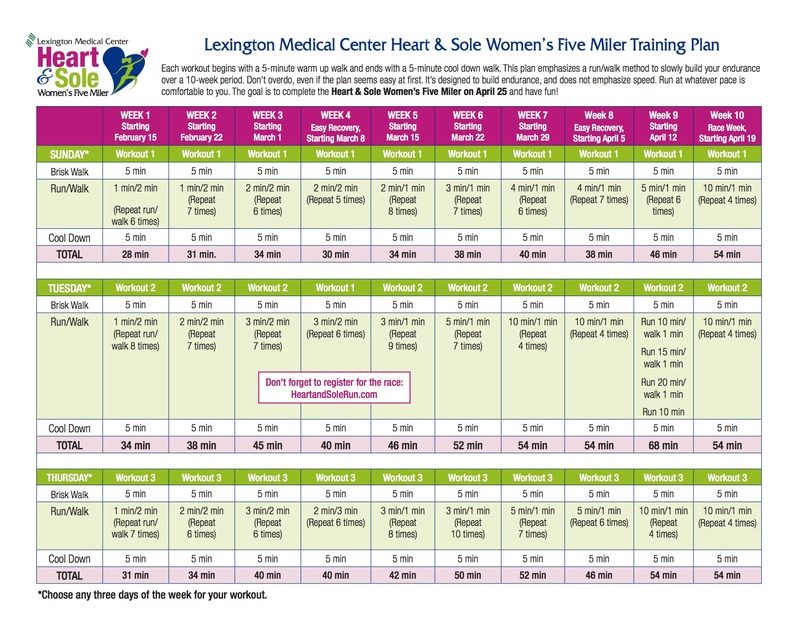 Want to participate in the Lexington Medical Center Heart & Sole Women’s Five Miler, but not sure how to get started training? Check out our 10-week training plan! This plan emphasizes a run/walk method to slowly build your endurance over a 10-week period. Don’t overdo it, even if the plan seems easy at first. Too many people have been turned off of running by starting off too fast. This plan is designed to build endurance, and does not emphasize speed. Run and walk at whatever pace is comfortable to you. The goal is to complete the Heart & Sole Women’s Five Miler on April 25th and have fun! This entry was posted in Advice, Health, Heart & Sole Women’s Five Miler, Heart Health, Women and tagged beginner runner training plan, Columbia, every woman blog, Famously Hot, Heart & Sole Women's Five Miler, Heart Health, lexington medical center., South Carolina by lexingtonmedicalcenter. Bookmark the permalink.